Defender Craig Reid has won a new two-year contract with Motherwell. The 28-year-old, who made his senior debut with Queen of the South, joined Well on a short-term deal in February after leaving Morton and made 14 appearances for the Fir Park side. 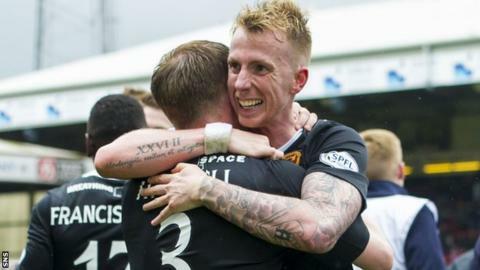 Motherwell manager Stuart McCall told his club website: "Reidy came in when we needed help last year and performed fantastically well for us. "A real unsung hero in the last few months of the campaign." A final-day win over Aberdeen allowed Well to leapfrog their hosts to secure the runners-up spot in the Scottish Premiership. "I was delighted for him to be the man who scored the winner at Pittodrie," said McCall, who had originally signed Reid as injury cover. "It was just reward for all the hard-work he put in and the sacrifices he made. "He provides us with a good option at full-back but also in midfield. "He's also the type of lad who will run through a brick wall for the cause and you can't have enough players with that attitude." Reid, who was a youth with Celtic, expressed his delight at the way it had worked out for him in the top flight after leaving Morton, who were relegated from the Championship. "It was incredible just how things went for me last season, particularly the way the season finished," he said. "With a good, settled pre-season behind me, I just can't wait to get going again."